SalesForce.com was founded in 1999 by former Oracle executives. SalesForce kicked open the door to show that a subscription based SaaS computing model could generate millions of subscribers and helped to legitimize the Cloud as a viable computing platform. Now the Cloud has become the buzz word of the moment and a place where great software can help real business get done. For the past several years new content management software options have begun to make headway as an alternative to expensive on-premise document management and collaboration software products. In early posts I touched on some of the companies leading the pack in terms of subscribers, customers and technology. Each has its unique approach in terms of licensing, technology vision and usability. When an organization is evaluating some of these newer technologies they must still consider that in their business the underlying methods of processing a business transaction remain unchanged. An organization has several key business functions that must occur whether they sell a product, service or a combination of both. We can think of this as the widget revenue cycle. 99% of the time when you implement ECM technology on-premise it plays a supporting role to existing systems and operations. Most organizations have a financial management or ERP solution like JDEdwards, Oracle e-Business Suite, SAP, Dynamics, Syspro, Sage, Epicor or some other niche market alternative. These are the systems that drive the business. ECM solutions on the other hand will support these systems by providing access to unstructured information not contained in the ERP records or datasets. The supporting documents become very important when exceptions or inaccuracies in a transaction occur. Examples of the supporting documents can include both paper documents and electronic files such as invoices, claim forms, emails, checks, bills of lading, contracts, correspondence and so on. In addition these records continue to provide value after the widget revenue cycle is completed for audit and legal retention purposes. 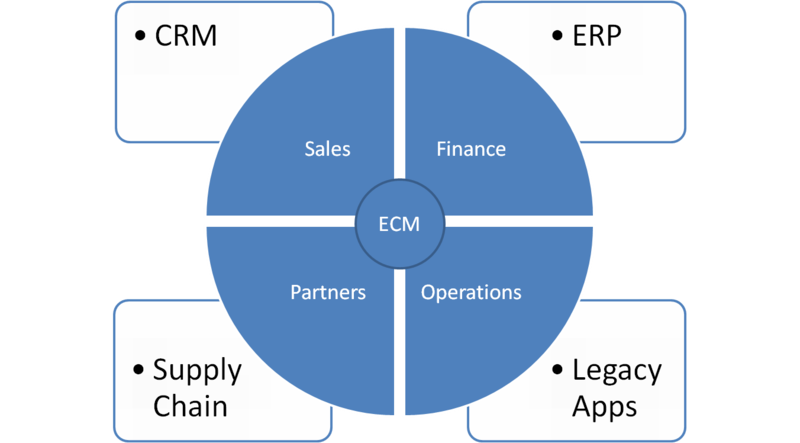 In my experience most organizations see a substantial benefit from connecting or integrate the ERP data with the content stored in the ECM system. This connection provides and easy method for toggling from the transactional ERP data and user interface to the supporting documents stored in the ECM system. CFO’s who are looking for tangible return on investment benefits before green lighting an ECM project should consider this as a key function that can help reduce errors and trim the labor costs associated with exception handling. CIO’s will want to consider how this is accomplished and make a determination between the use of a tight integration vs. a loose integration and the pros and cons of each. It is typical that any mechanism requiring programmatic code changes to existing systems is costly, may not be supported by the vendor or is not a priority for IT departments. It can be preferable to use a lose binding method for keeping the existing systems in synch with the ECM information and still achieve the automation required to increase user access and ease frustration by making it easy to find associated supporting documents using the transactional ERP data and user interfaces. When you are evaluating how to implement or select a Cloud based model for ECM an important question to ask is: “how are you going to integrate the solution to provide for seamless connectivity between the our existing systems and the supporting documents and records”? I don’t want to go to deeply into the technical aspects of unique record id’s, data cleansing, data mapping and integration API’s as you may find yourself nodding off. Let’s just keep it to a high level diagram and take a look at a technology product that may help you bridge the gap. In enterprises large & small, end users are spending their time performing their primary job functions (e.g. taking orders, placing orders, administering payroll or personnel, admitting patients or students, etc.) with the aid of existing information systems or line of business applications. The predominant method for performing the functions is through Windows desktop or legacy host applications. If a Cloud based or hosted (SaaS) applications is to be considered as an option for the enterprise we must understand that the vast majority of users are still bound to on-premise applications to run the business. What’s more they trust the data and where it is stored. That is why the Salesforce.com example is so important; it helped prove that you can rely on software services and data being hosted and stored off-premise. Getting access to documents and unstructured content from a Cloud based repository could require copying & pasting of metadata to execute a document search or workflow step. This creates lots of clicking and keyboard shortcuts; this takes time and often requires repetitive steps for the user. This results in more work and frustration for the users in order to service their document retrieval needs. What if you had an automated mechanism which binds the business application at the user’s desktop with the content in the Cloud? A very simple method of automating this process using repeatable methods is Karora AppConnector. This product uses a lose binding method to take application data from application screens and automates the steps required to execute searches, workflow steps and metadata indexing through the use of a floating button bar.